Written and starring written by Rafael Casal and Daveed Diggs two childhood friends who grew up in Oakland, California, BLINDSPOTTING is less a structured film than a series of incidents tied together to tell a story, as manipulative as it becomes. They felt that cinematic portrayals of the San Francisco Bay Area have constantly “missed something”. Their flawed film wanted to draw attention to the culture, community, and sense of “heightened reality” that shape life in Oakland, high goals. The film therefore addresses issues of gentrification, police violence, and racism. But the film provides no solutions and only poses more questions. 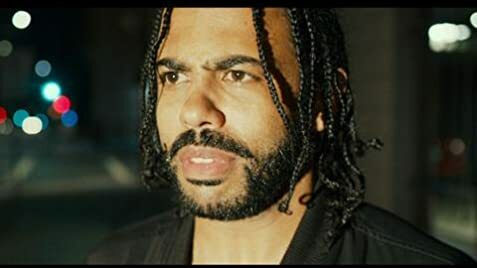 The term BLINDSPOTTING is at one point explained in the film by a psychologist that it is the spot that an individual wants to see in a certain situation, which might not be the case in reality. The brain sees one image and blocks out the other. It is the fighting they Collin sees in many an incident. The film opens with the probation conditions laid upon convicted felon, Collin (Daveed Diggs) after serving his term in prison. It is a year long probation where Collin has to meet various conditions including keeping an 11 pm curfew and not get into any altercation with the law. The film follows two childhood friends, Collin and his trouble maker white best friend, Miles (Rafael Casal), through the last three days of Collin’s year-long probation. 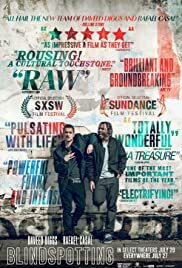 Collin lives in a probation house and struggles with trying to get his life in order and put his criminal past behind him, while the short-tempered and rowdy Miles searches for trouble and embraces the “street” lifestyle. One night while waiting anxiously for a red light to change in order to get home for his 11pm curfew, Collin witnesses a white police officer (Ethan Embry) gun down a black civilian, an incident that haunts Collin over the next few days. Immediately observable is the fact that Collin initially appears scared rather than angry at the injustice. Miles purchases a gun which ends up in the hands of his young son Sean, an incident which horrifies Sean’s mother Ashley (Cephas Jones). Collin begins to realize that Miles’ recklessness will likely land him into trouble, and the two are set on an explosive collision course. When Collin was in prison, it is pointed out that Val never visits him while Miles does. Val claims the reason Miles visits him is that he feels guilty and that he should have been the one in jail. As the film is manipulative, it never addresses the reason Val has never visited. But to one in prison, a visit by a friend means lots. Collin on the other hand, is trying to keep his relationship with Val (Janina Gavankar). These are two friends that should stay away from each other. Things reach a boil when Miles purchases a gun, that he uses freely without restraint. Yet the two get a job together Collin meets the bad cop, who happens to be one of the people the two have to move. Occasionally engaging and funny, BLINDSPOTTING is original for the fact that audiences might not be familiar with the ‘Bay’ Oakland area. Though the film shows promise, the uneven BLINDSPOTTING lacks structure and a strong narrative.